Mornings are crazy with everyone rushing around to get out of the house it can be pretty intense and it is easy to forego a nutritional breakfast due to not having enough time. 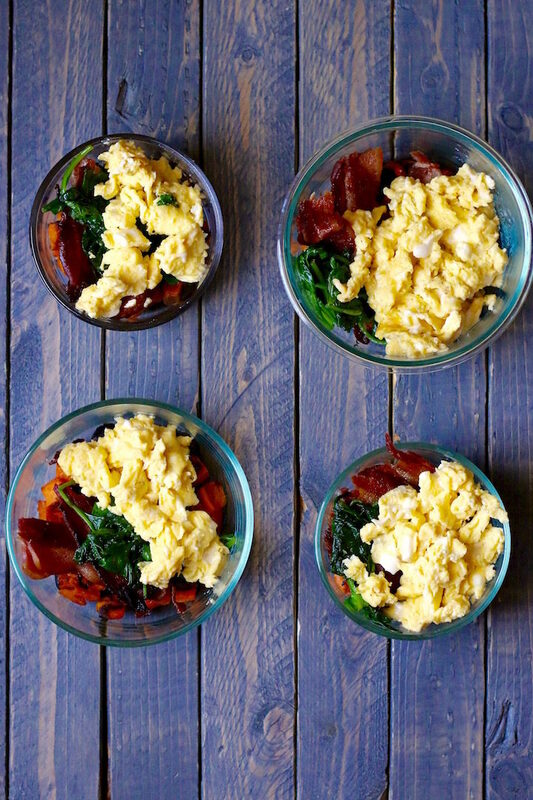 These Breakfast Bowls are freezer friendly -allowing you to make a big batch on the weekends so you have a ready to go hot breakfast when you’re feeling pinched for time. They say that breakfast is the most important meal of the day. I am sure you have heard that phrase before. Sometimes though it is tough to have enough time to make a meal every morning. 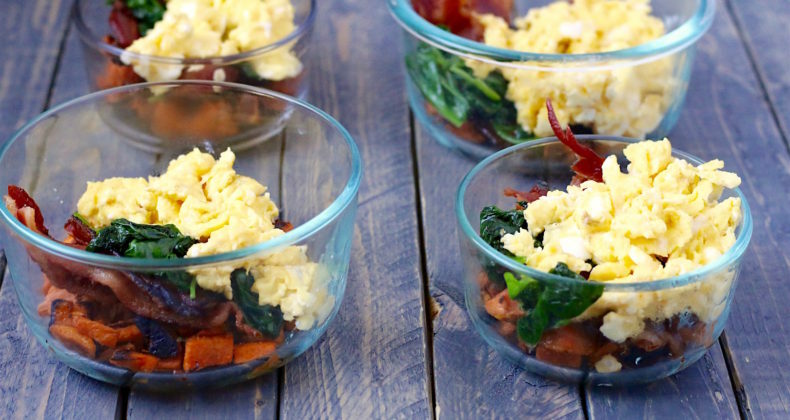 Breakfast Bowls take just a little time on the weekend or in the evening to prepare and you can easily double this recipe to make eight bowls instead of just four. This has a little bit of everything: protein, greens, and some good carbs to help get you through your morning until lunch. This is one of those buzz word friendly breakfasts. If you search the web for #JERF and you will find tons of recipes for Just Eat Real Food. This my dears is real food AND it only takes a couple minutes to reheat in the microwave either at home or once you get to work. For me this has been a game changer in the morning. What are your favorite quick, easy, and healthy breakfasts? Bake bacon on a parchment lined baking sheet at 425 degrees F for 10-15 minutes depending on how crispy you like it. Check out the produce section where you can find already peeled and cubed sweet potatoes to make things a little easier. Toss with a little oil, salt, and pepper and roast at 425 degrees F for 20 minutes or until they start to brown slightly.